Hanoi Rocks original gig posters from 1980-1985 & from 2002 onwards. I'm looking for flyers,ticket stubs,posters,photos,magazine articles from the April/May 1981 UK Subs & Hanoi Rocks Finland tour and posters,flyers and ticket stubs from Hanoi Rocks 1984 U.S tour. 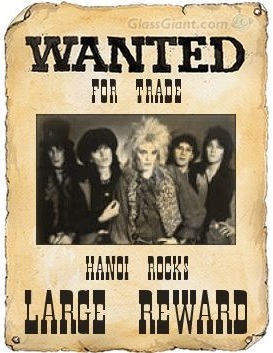 I'm also looking for original 1980's Hanoi Rocks T-Shirts.Genuine ones only,I'm not interested in recent reproduction T-Shirts or cheaply made rubbish from Thailand. This T-Shirt is one I'm looking for: HANOI ROCKS 'BACK TO MYSTERY CITY TOUR' '84. These T-Shirts were made for the gig that was scheduled to go ahead at the Commodore Ballroom in Vancouver,Canada on 5th May 1984.The gig was cancelled. I would like to make regular contacts in Finland & Japan to trade with or buy Records & CD's and memorabilia from. There's been some misinformation in many discographies regarding members of Hanoi Rocks featuring as guest musicians on U.K. bands records.Quite a few people have offered me records,in the belief that Hanoi members are playing on them. BEWARE OF COUNTERFEIT CD'SThere are many counterfeit CD's & DVD's circulating.Many of these originate from the far East and Russia. The Japanese CD's,particularly the mini LP CD's,seem to have been heavily counterfeited.If you've bought Japanese CD's cheaply on ebay from countries such as China,Indonesia,Russia,Taiwan,Thailand or Vietnam or bought the Japanese CD's cheaply at market stalls the likelihood is you've bought a fake! On a final note,please don't offer me any Japanese CD's that have been bought on ebay from China,Indonesia,Russia,Taiwan,Thailand or Vietnam in a trade as any fake CD's will be returned to you and our trade will be concluded. It seems that the much sought after and extremely expensive Hanoi Rocks bootleg double LP "Razzle-Dazzle" has been re-bootlegged.In 2010 no fewer than Seven copies have turned up for sale on eBay,they appear at a rate of One a month!The original record is 'Megarare',only a few hundred were pressed in Japan in the late '80's and most of these ended up in the hands of Japanese collectors.Very few have turned up for sale over the years,for Seven copies to appear one after the other is unheard of.It seems to have been repressed recently and being sold for a high price.There maybe a genuine copy in there amongst them but beware!